Antique Persian Kerman Runner Rug, Country of Origin: Persia, Circa Date: 1920 — Like many traditional Antique Kerman runners, this antique Persian rug is beautifully ornate and skillfully woven, holding a mature beauty that draws and captivates. 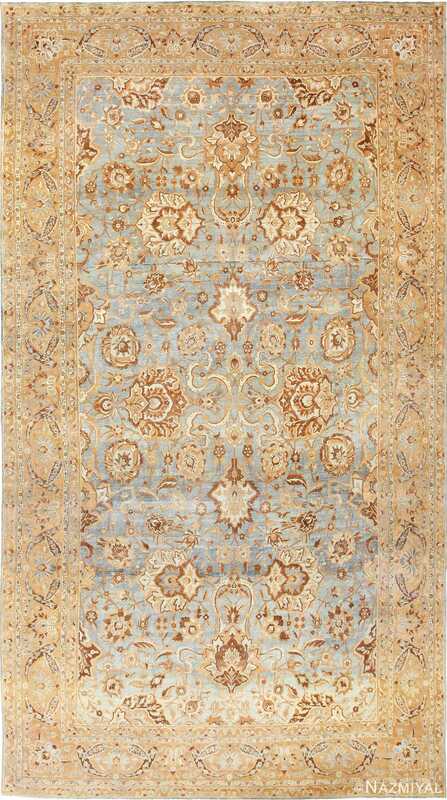 Fine and intricate floral design patterns flow over the light navy background, and the border features full chains of blossoms intertwined with vines in a delicate sky shade, which is accompanied by a deeper Aegean blue in this antique rug. Accenting the antique Kerman rug and making up the foreground of this runner are several marigold shades, contrasting with the cool-toned blues. The shades contrast against and work with one another to create a fantastic palette that becomes even more luxurious. This sharpens and deepens the carpet’s artistic appeal to create a grounding harmony that welcomes the viewer to follow the full course of this beautiful antique hallway runner rug.